Of all the Star Trek pictures that have been made. 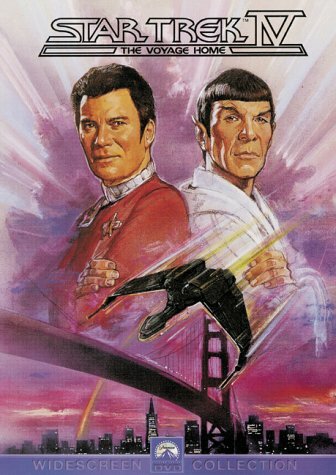 Star Trek IV the voyage home is yet the best. With the original cast that made the first series and all the rest so popular. The new mission of the U.S.S. Enterprise was to save the Earth in the 23th century from destruction. The star ship which has been in exile for a long time decides to go back home but when they arrive home they are faced with a problem. Earth is being destroyed by an unexplainable source. They find the reason for the problem and Admiral James T. Kirk takes control and decides to go out and find , the source that will stop the destruction of Earth. As usual he doesn’t put attention to the orders given not to go and find the source and off they go. For once the basis of a Star Trek film is not to save the Earth and its inhabitants from fake looking aliens. Already the over used story line of .. terrifying aliens that come to destroy Earth is too old. In this film the destruction of Earth is the cause of one of the biggest , problems we now are going through, the problem of diminishing species. It is surprising to see that an issue like this could be used in a story that deals with a view of what would earth, be like with out this species that now are in danger. As director and writer of this movie Leonard Nimoy shows part of his various talents. The cast of original players again outstanding themselves. It is amusing to see humans from the 23th century trying to get along in San Francisco in this century. Admiral James T. Kirk is played and always will be by William Shatner. The always handsome, smart Kirk who always comes out on top and always gets his way. Shatner as usual plays his role to a tee. Always at Kirks side the unfeeling Mr. Spock, played by Leonard Nimoy. Spock plays the faithful half-human half-Vulcan right hand man to Kirk. Spock still not fully recovered from his last adventure is not himself, more feelingless than ever. Then there is Dr. Leonard McCoy played by DeForest Kelley, with his wilful humor mostly directed at poor Spock who in his emotionless self doesn’t get them. McCoys usual lines are still in like “you can’t do that Kirk,” and his healing machine that cures anyone and anything still works. Sulu the Helmsman of the Enterprise is played by George Takei. Chekov is played by Walter Koenig the foreign member of the crew. With his accent he always gets himself in trouble and winds up the hurt one in the movie. And last but not least Commander Uhura the only female member of the crew that made it. Uhura is the Communications Officer aboard the U.S.S. Enterprise. The graphics look a bit outdated, considering this movie was made in the 1980’s. But the storyline is as relevant to our present problems.